Five of the best organic British cheeses we’ve tasted: Green’s of Glastonbury’s powerfully nutty vintage cheddar, Caws Cenarth’s gooey brie and traditional Caerffili, unusual Seven Sisters sheep’s cheese with wild Hebridean seaweed, and award-winning Cropwell Bishop stilton. A fine festive cheeseboard sorted! Serves 6+. 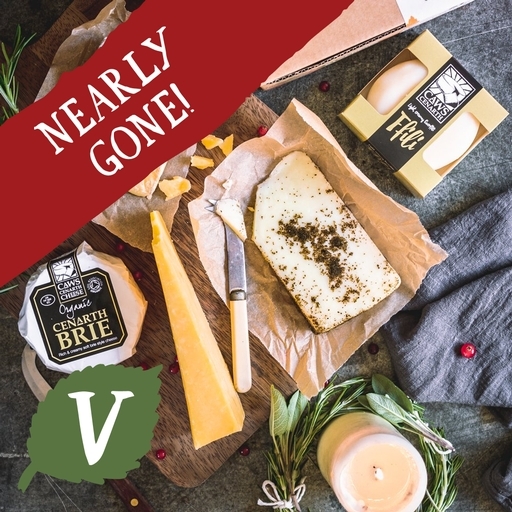 Green's vintage cheddar: Pasteurised cows' milk, salt*, starter culture, vegetarian rennet. Seven sisters sheep cheese: Pasteurised sheep milk, sea salt*, seaweed, vegetarian rennet, cultures*.